Homilist: Dominican Father Matthew Boland gives the homily at the Mass in Our Lady of Graces Church, Carina, celebrating the end of the Dominicans’ 800th jubilee year. Dominicans around the world are marking 800 years since St Dominic founded the Order of Preachers. Brisbane’s Dominican community gathered for a Mass at Our Lady of Graces Church, Carina, on November 6, for the conclusion of a year of celebrations. This is the Homily from Dominican priest Fr Matthew Boland, based in Melbourne. WE gather to mark the end of the jubilee celebrating 800 years of the Dominican order. 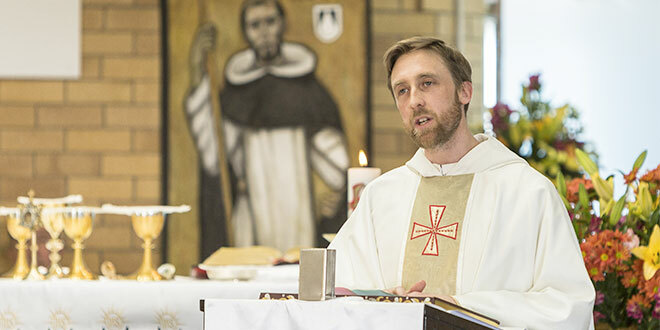 This is an important time, for members of the Dominican order, and for you, the members of this parish; as members of this parish you are part of the Dominican story and part of Dominican history in Australia. Of course, we are all part of an even larger story, which unites us, a story which goes back 2000 years to Jesus, and one which ultimately goes back to the beginning of time. But I reckon 800 years is still pretty good; and something worth celebrating. But the question arises: What is a jubilee? Why do we have these big celebrations to mark the passing of time? There are three aspects to it. Firstly, a jubilee is a time to look back and remember the gifts and graces we have received from those who went before us – to see where we’ve come from. So we reflect on what St Dominic started 800 years ago – the way with such calm confidence he began something the Church had never seen before, something new. It wasn’t a break from the past, but was a fresh expression of God’s grace. St Dominic founded a group of people who dressed and behaved like monks, but were dedicated to moving around and going wherever they were needed to preach the Gospel. We can see the power of God’s grace in the order when we reflect that just 55 years after he began the order, there were about 13,000 friars, and 58 convents of nuns. And the order has been grace-filled throughout its history, producing great reformers like St Catherine of Siena, also a great mystic – that is the beauty of the vocation – activity and spirituality go hand in hand – great minds, perhaps the greatest in St Thomas Aquinas, humble Dominicans filled with charity like St Rose of Lima and St Martin de Porres, who is also the patron of this church, great popes such as Pope St Pius V, who encouraged everyone to pray the Rosary during the battle of Lepanto which saved Europe, great artists like Fra Angelico, whose spirit is kept alive in this parish by our own Fr Maurice Keating. We also remember the beginnings of the Dominican presence here in Carina, or Belmont, as it was also called then, in the middle of last century. Frs Lewis and Corry were the pioneers. The provincial of the time, Fr Mannes Cussen, described them as the “opening batsmen” for the Dominicans in Brisbane. We know the story of the hardships, including the marquee, which served as a Mass centre early on, as we remembered in our procession this morning; we remember it fondly even though the council wrote a threatening letter at the time because we didn’t get permission to erect it. We also remember the sisters who came here to offer their lives in the service and education of others, including Mother Benedicta Mary, the first principal of St Martin’s, and Sr Mary Jude, the first principal of San Sisto. And, of course, we remember the industriousness and ingenuity of the parishioners which helped build this parish, both figuratively and literally; especially those who staffed the Parish Purse during the 16 years from 1972-1988. We remember all those people who have contributed in making Our Lady of Graces what it is today. That is a big part of a jubilee. We look back and remember those who have gone before us, and those who have helped to build what we enjoy today. The second aspect of a jubilee follows from this and, although no less important, is much easier to state. We are grateful. We gather today to give thanks firstly to God, for his gifts, but also to St Dominic and the Dominican order, and to all those who have contributed to building up this Dominican parish to what it is today. Much of what we have in our lives is received from those who laboured before us, and ultimately all we have comes from God, so we give thanks to them. There is one more step to a jubilee. We remember, we give thanks, and then, perhaps the most important part, we look forward to the future. By reflecting on the example of so many saints, and the generosity of those who have gone before us, we are inspired to do great things ourselves. As it says in the letter to the Hebrews, “Since we are surrounded by so great a cloud of witnesses, … let us run with perseverance the race that is set before us”. The whole point of Jesus’ incarnation, the Dominican order, and our Christian lives, is the salvation of souls, our souls and the souls of others. This is the jubilee: we look back and remember, we give thanks for those who have gone before us, and we are inspired to continue striving to bring about the Kingdom of God. St Thomas wrote a beautiful prayer honouring the Eucharist which we Dominicans repeat several times a day to remind ourselves of it. I think it gives us an insight into the nature of a jubilee. St Thomas teaches that every Eucharist has those three aspects of remembrance, gratitude and anticipation of the coming Kingdom of God. For St Thomas, every Eucharist is a jubilee. So as we approach the Eucharist at this closing Mass of the jubilee year let us give thanks to God for all the gifts he has given us, especially through the lives of St Dominic and Catherine and the Dominican order, and through the parishioners, sisters and friars who have laboured here. And let us ask him, through the intercession of Our Lady of Graces, to fill us with his grace and give us the strength to continue to strive for holiness in our lives and bring about his Kingdom here on earth. Then, one day, we will be united with all those who have gone before us, praising God with Mary and all the angels and saints for all eternity in heaven.